Pinksummer: Artaud wrote the following pertaining to his theatre: “Populating the space to cover emptiness, is finding the path back to emptiness”. Artioli and Bartoli, in an extraordinary essay on Artaud, brought Artaudian metaphysic linguistics to a situation of suspension that searches for the vibratile point in which what is shape begins to vanish, dissociated matter that produces energy, huff, destroying the fetishism of text and the link between signified and signifier. Such words are not uncontrolled raptus, but knowledge of the laws of life that fluctuate between fullness and emptiness with a dual centripetal and centrifugal rhythm. This second “solo” show of yours at pinksummer is materialized from, on and around language. Your linguistic strategy seems to float between presence and absence; the word, crystallized substance, seems to be on the point of dissolving and yet live autonomously, taking the shape of the sudden freight of the soul. You seem to be the first onlooker of this show: in the Artaudian theatrical stage, conceived in a circular way, emptiness is at the centre, at the point where the spectator stands, while fullness is on the outskirts, on the verge of being swallowed by nothingness. 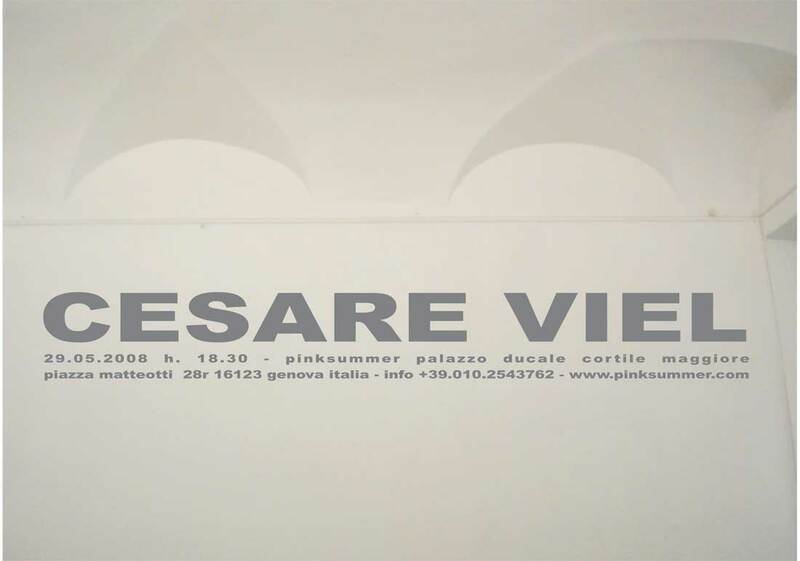 Cesare Viel: I’ve always had a strong attraction for emptiness and for precipices. Since I was a child I was fascinated by exhibiting a doll on the other side of the railing of my balcony, on the sixth floor. I stood, staring at the body of the toy suspended in emptiness, just being held by my hand. I always feel a creative shudder when I see divers jump from the highest springboard and, in a few seconds, transform themselves into perpendicular projectiles that pierce the surface of the water. It is like being on the edge of a dam and looking, from one side, at the lake of water, and on the other the vertical wall of restriction, and feeling the immense force of the energy that is there. As an adult, I understood that these experiences are deeply connected to the double amazement for existence – its wonderful and disconcerting gratuitousness – as well as for the language that contains us, describes us, and tries to translate this emptiness, to limit this feeling of precipice. Perhaps language is like the hand of the child that holds the toy suspended in emptiness, while observing himself, the toy, the horizon of the space in which he is immersed, everything around, the whole – and uncatchable – context of this situation. Words let you see all of this, also when it is no longer present. Language creates images and at the same time it can dissolve them. This ability of language of building and dissolving, of letting seeing and going beyond what can be seen, is for me like a core of very powerful energy. Inside language there is a tension to escape from itself, and for this reason there is also a loss, an emptiness that fascinates. The first onlookers of this show of existence and language cannot be but us having this experience, and then us trying to show it to others, amazed by the fact that they have not immediately pointed it out to us as the most important thing. Why didn’t they want to tell us about this experience of void itself when we were children? Not to frighten us, to protect us? Because it is inexplicable, paradoxical, unbearable to manage? We never stop dealing with the void, with the lack of foundations. Artaud understood that and went through to the bottom of it. P: Plato in “Phaedrus” moves from a talk about love and beauty to claiming the ontological value of the word, affirming that the speech of the rhetorician is based on the opinion and on the criterion of likelihood, so we can say everything and the opposite of everything, while the speech of the philosopher is based on the knowledge of the object of which we speak, and about the knowledge of the mind of men who the speech must persuade. In this sense Socrates, in the platonic dialogue, distinguishes orality from writing: “The true book of the philosopher is not what he writes on paper, but what he writes in the soul of men”. He compares writing to a game, that of the “garden of Adonis”, in which, in order to celebrate Adonis, seeds were sowed in a pot to blossom and wither in a few days without producing fruits, and orality to the work of the farmer who tends to harvest, fruit that produces other seeds, and therefore for Plato orality is immortal language. Your language, also considering your performatory work, seems to seek an identity between orality and writing, in both cases you seek for a distance from your own word, you have already abandoned it to itself: also in presence of a gesture, the word has already been pronounced and you remain mute. The word fluctuates in air like an echo, by now far from you. C.V: Since my first works, I’ve been aware that I was taken in by words. Words told me and exceeded me. Within the indical dimension of handwriting – of the gesture and the action of writing – a perpetual movement of language potentials come out. From the written to the spoken word – the grain of voice – the game of returns is infinite. When I create a work with words I never know what comes first, if the orality or the trace written in the thought. They arrive, come up, present themselves together, and at the same time are already split up. They are already broken, crossed by in their contingency. I do not try to reassemble them – the orality and the writing – expecting that they form a unitary and monolithic performance: an abstract and a unique voice. They show me their right to exist. And so I try to respect their differences, their manifold – and loving – relationship. I try to make their reciprocal incoherence emerge. Words are shown in many shapes: written, seen, pronounced, sung, thought, dismissed, listened to, read, acted. It is immediately taken into an endless plural, singular, private and public relation. Echo is what remains of words that are no longer yours but that however ask you to be taken, again and again, to repropose them in a never ending circuit. P: Regarding the suspension that language creates in your show, we tend to look towards the unexpressed, or better towards the inexpressible, meant as the impossibility to express described with wonderful lyrical eloquence by Dante in the Paradiso, but as well and with as much significance and concreteness by Wittgenstein in the Tractatus, who, looking for a perfectly logical linguistic structure, based on a rigid parallelism with reality, traces a bound in front of our thought: “about what we cannot talk, we must keep silent”. Therefore, wisdom is inside silence and ethics in the unwritten part of the Tractatus. Admitted, then, that the supersensible exists, it cannot be expressed by our language, the language being the impassable boundary of our world made by facts. Beyond that limit there can be no expression, and admitted that expression exists, it doesn’t belong to us. In that limit someone has foreseen Wittgenstein’s mysticism: the mystery of faith. In your show the word seems tempted to start off beyond that limit, letting listeners, and whoever reads, sense it, and exactly in who listens, in who reads it, it finds the concreteness of the limit and at the same time its possibility. C. V: Here, for me, comes the central question of the body – and here I intend that of art too -. Sometimes the body wants to sleep until late – staying long in the darkness -, sometimes it wakes up at dawn and seeks contact with the first daylight. Is the reason for these behaviours completely expressible? After all we can explain, a residue that wants to be heard, that continues to resist and cannot be told stays at the bottom. It is this resistance to tell itself that interests me. What can’t be expressed we indicate, we show, Wittgenstein said. The body acts the inexpressible, and language is a body. What can’t be said is in front of us, and we see it. Like, in the morning, the first daylight. Art goes there, where the unexpressed is nested, and insists. The whole show works around – and thanks – this dimension. P: How will you articulate your project at pinksummer? C. V: Three new works: “Avvicinandoti a distanza” that deals with vertical and frontal dimensions; “Ti sento passare” that deals with width; “Mi trovavo a casa” that deals with a circular, intimate and deceiving one. They revolve around an intense, private event. A crossing of the limit, a meeting with the void, with an absence, with a silence that moves to and lives inside language: walking on its edges to indicate its phantasmal and regenerative force. A nucleus loaded with energy that relates with space, and openly gives itself up to be read, the listened to, publicly and plurally – both literally and metaphorically– of the other.